Give the demo a try - you might be beguiled by the different perspective they give you on the loudness of your tracks. Look great. Do the job. Missed opportunity - no gain knob. 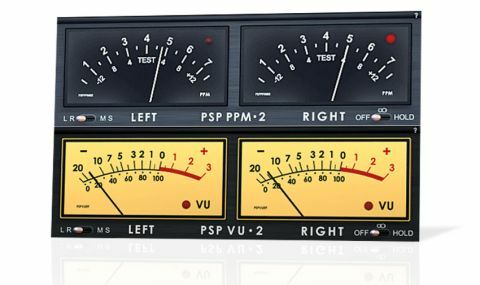 As straightforward a proposition as it seems, PSP 2Meters is a pair of analogue-style metering plugins: PPM2 and VU2 - the first providing European and BBC Peak Program Metering, the second for Volume Unit (average loudness) metering. "Both meters can be customised via a back-panel settings page"
Both can be customised via a back-panel settings page, including reference levels, Integration, Hold and Fall-back times, overload sample number thresholds and more. In action, they look great, with Overs LEDs and realistic ballistics. However, they don't actually do anything at all beyond measuring your output levels, which feels like a missed opportunity - we certainly feel their utility would be enhanced by the addition of a gain knob to each plugin. Whether or not you really need to invest the princely sum of $15 in 2Meters obviously depends on how happy you are with your existing metering. If all you've ever known are software DAWs, with their LED-based peak metering, give the demo a try - you might be beguiled by the different perspective they give you on the loudness of your tracks.